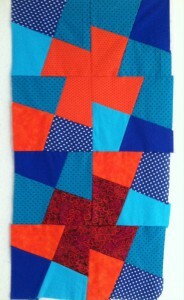 Here is a block called magic squares, also from the Mac Attack workshop at New Pieces. This is a tessellation. All four of the pieces in each block are identical. I must have rearranged the pieces as I was sewing them together. 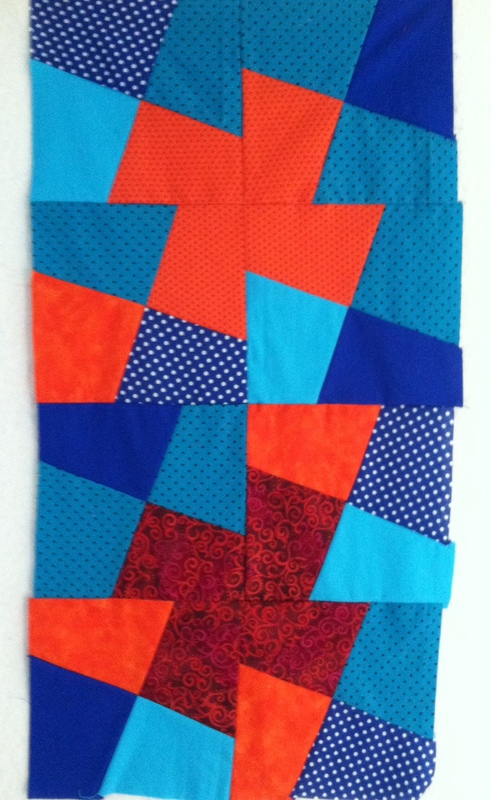 There was supposed to be a teal pinwheel in the center, between the red one and the orange one. I like it this way too. I was in a hurry when I sewed it together. I had missed almost two hours of the workshop when I went home to let in the furnace repair guy. I dashed back and tried to absorb everything I’d missed as fast as possible. These are difficult to get in preplanned order, but your plan B looks great! Are you planning on making more? I did this type of block for a workshop – we were supposed to end up with 16 blocks, I did but I had to use the seam ripper too much so didn’t get things sewn together like the other folks did. I had used the same background so I couldn’t finish it the way you did. It’s an interesting block though and some people have a lot of fun with it in blog land. Other than the workshop I took though I have not seen in person. Your choice of colors and fabrics makes everything look so nice.